Paintings of Greek mythology often depict the deities supping on bunches of grapes. The sweet fruits were considered worthy of the gods for good reason. Grapes are an excellent source potassium, calcium and vitamin A. The juicy orbs are also a delicious, low-calorie treat in your daily diet. Red or green, seedless, European-type grapes have 3 calories per grape. 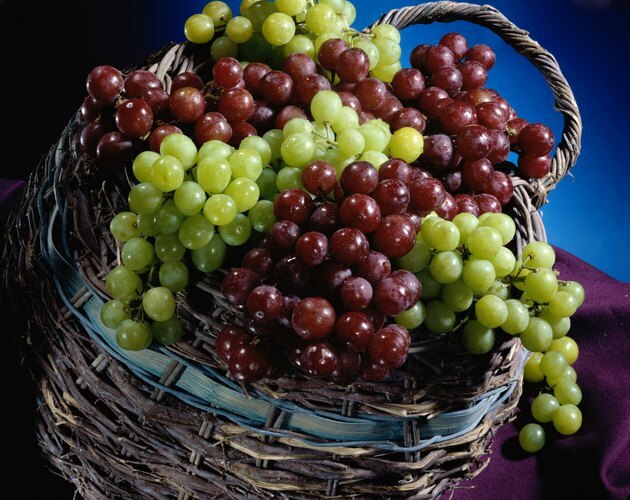 American slip-skin grapes have 2 calories, while muscadine grapes have 3 calories per fruit. Choose fresh fruit over grapes packed in heavy, sugary syrups. One cup of canned grapes packed in syrup has almost 200 calories compared to 1 cup of fresh grapes with roughly 100 calories.